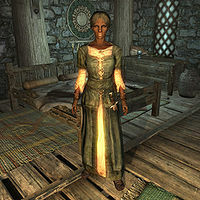 Saffir is a Redguard who lives in Whiterun with her husband Amren and their daughter Braith. Lately she has been having arguments with her husband over his continued hunt for his father's sword which has cost the family a significant amount of money. While she understands that his family's past is important she realizes that they are running out of money. She is quite the bookworm and can often be found reading inside her home, where she spends the majority of her time, from when she wakes up at 8am until she goes to bed again at 11pm. On occasion, she puts down the book for a quick meal or a bit of conversation with her husband and daughter when they are at home, but otherwise she prefers to lose herself in a book instead of socializing. She wears clothes, boots, and gloves, and equips an iron dagger while also carrying a key to Amren's house, and a selection of common items and gold. She will frequently talk about her love of books with remarks such as "Nothing like a good adventure or romance to lose yourself in" or "I import books whenever I can. 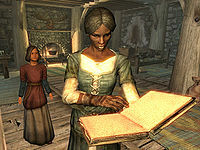 Most Nord works are too bawdy and violent for my tastes." If you interrupt her while she is reading she will comment "Excuse me, but I'm trying to read", "Damn it, I lost my page..." or "Back to my book...". If found outside, she will impatiently state "I just want to go home and read." or "If you'll excuse me, I really just want to get home." More worryingly, she will tell you how she does not spend much time with her daughter when she remarks "My daughter Braith says I read too much. 'Play with me, mother!' Girls need to learn how to take care of themselves." However, she also shows a caring side when saying "Really, I wish my girl would read more. It would certainly keep her out of all those fights." 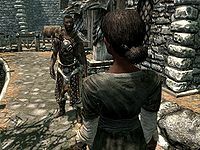 Asking about the Alik'r searching for a Redguard woman will reveal that she has no idea what you are talking about when she says "The who? I'm sorry, I have no idea what you're talking about." "You can claim your sword, or you can keep your wife." Braith: "Mother? Can I talk to you?" Braith: "I wanted to ask you something. It's about a boy..."
Saffir: "Not now, Braith. Go... go ask your father."